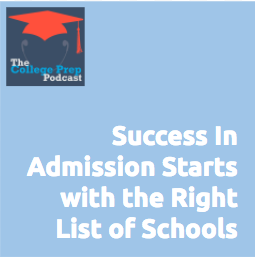 Most admission disappointment start now, with families who don’t take time to create the right college list. The top mistakes families make when compiling their own college list. The six kinds of schools that should be on your list including: 1. the most affordable option, 2. the assured admission option, 3. good match schools, 4. the highly competitive option, 5. scholarship potential, and 6. and in-state option. What order you should apply to those schools so that you don’t burn out. Megan also shared a resource for how to google a school to find out if it’s an “assured admission” or “highly competitive” option.